Young people are using technological devices more and more as a source of enjoyment and engagement, including using games consoles or communicating with friends via social media platforms. During the 21st century, this form of entertainment has become increasingly popular, causing experts, as well as concerned parents, to ask: is such excessive use of and reliance on technology detrimental to children’s health? A review of research by the British Psychological Society suggests that device use is safe in moderation. Experts advise that as long as device use is not in replacement of other experiences (especially sleep) and balance between screen and non-screen time is encouraged, then there are many positive uses of technology for young people. What must also be considered is that growing up in an age where technology is constantly developing, it is crucial that young people are educated and have an understanding of how technology functions, as well as how to navigate it safely and effectively. By providing future generations with this knowledge, they may also become aware of the vast opportunities technological skills can present them in the future. Possessing an understanding of technology and how it operates is a skill that is rapidly becoming more crucial. This is relevant for school study, as well as successful career choices – not just tech jobs. Many parents worry that jobs will be diminished as artificial intelligence continues to develop. However, thinking about this positively, it becomes clear that there is enormous opportunity for future generations to master this field, and experience hugely successful careers at the forefront of technological advancement. Demand for skilled jobs in technology industries is far outstripping supply, as technology continues to dominate business investment around the world. It’s no wonder we’re short of specialist knowledge if young people are pursuing careers in other industries. This leads us to question how we can ensure we are equipping young people with the skills they need for the future. It is the responsibility of parents and educators to make them aware of the potential technology skills have in tomorrow’s world. Perhaps if young people saw the value and relevance of acquiring these skills, they may be more motivated to develop them sooner. At Immerse Education, we aim to inspire future generations to become technologically minded. On our technology programmes, we encourage participants to develop practical and transferable skills that can be applied to their studies and future endeavours, expanding on the curriculum taught at school. 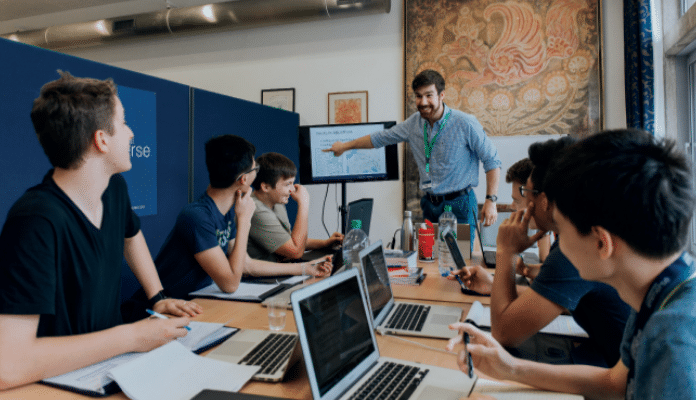 These courses offer the opportunity to learn innovative tech skills, but the wider implications encourage them to develop flexibility, creative thinking and problem-solving strategies. Our tutors, experts from world-leading universities, nurture the students’ passion for technology-based subjects. This guidance transforms an interest in technology, giving it both purpose and direction as they participate in technical workshops, key theory and exciting hands-on projects, showing them the endless possibilities that technological knowledge can provide. These skills, which will be so valuable in the future, are developed in an inspiring and supportive environment, where skills sessions are interspersed with cultural and social activities, teaching young people to develop balanced and healthy lifestyles. In short, interest in technology should never be seen as time-wasting or a cause for concern. If this curiosity is nurtured correctly, it may allow the next generation to thrive in a field which is innovative, dynamic and constantly developing. To ensure young people with these interests are utilising their potential, providing them with opportunities to learn soft skills in an engaging, fun and motivating environment will be hugely beneficial for their future prospects.